The Moto G5 Plus, a supersized version of Motorola's 5th-generation Moto E mid-ranger, looks to snag a spot among the best big-battery phones with its benevolent battery, which is an outright pro, coming from a phablet in this Android class. That said, many of its specs are not as generous, consequently blemishing its profile with a few cons. For one, it passes up on NFC (Near Field Communication) , a widely-used wireless protocol tailored to mobile transactions and data transfers that even lower-specked models manage to squeeze into their list of pros and cons. Additionally, it does not come with Motorola's trademark water-repellent coating , making it less splash-ready than the Moto G6 and its variants, which hit the market at around the same time. As mentioned earlier, this 197g-heavy phablet banks on a whopping 5000mAh battery that's a welcome upgrade to its base model's already-robust 4000mAh cell. Its battery pack claims to provide up to 1.5 days of life on a single charge and refuels using a 10W rapid charger. Regrettably, the rest of its hardware pros and cons, which include a low-caliber 1.4GHz quad-core Snapdragon 425 processor and either 3GB or 2GB of RAM, are not on par with its elite (as if this technical review) battery. 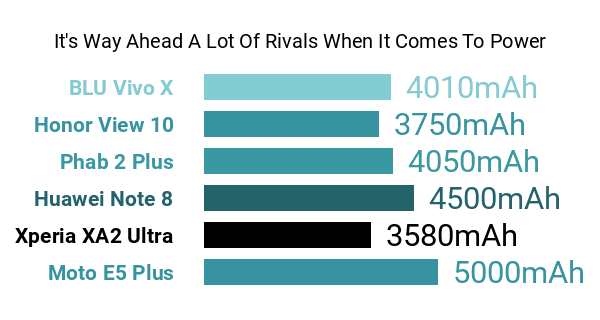 In comparison, some competing high-endurance models sit alongside the best eight-core smartphones. Its 32GB maximum internal memory sounds undistinguished as well, at least compared to the 64GB or 128GB storage caps offered by some other wide-screen heavy-duty models. It does support up to 128GB's worth of top-up storage, though. The Moto E5 Plus is fitted with a large 6-inch Max Vision (Motorola's way of saying that it has an 18:9 aspect ratio) screen , that sadly will not be joining the best phablets anytime soon, not with its measly HD+ 1440 x 720p sharpness . Sitting right above its screen is an entry-level 5-megapixel-only selfie camera that somehow comes with its own dedicated LED flash . 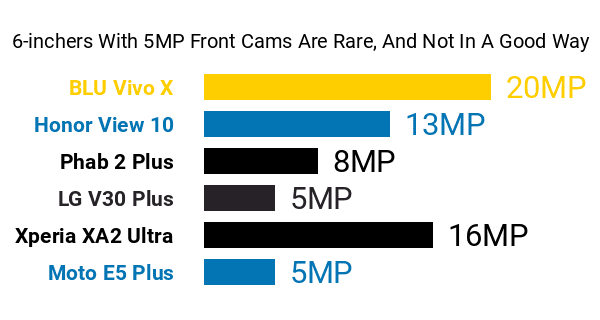 On the opposite side, it features a 12-megapixel f/2.0 primary camera that combines both phase-detection autofocus and laser autofocus as a method of reducing overall focus time. Also on board is a standard fingerprint scanner and a front-ported speaker, the latter being a typical design element among Motorola smartphones. It dons a reflective wave pattern on its battery cover and runs Android 8.0 Oreo from the get-go. In essence, the Motorola Moto E5 Plus is a middle-class smartphone for buyers who want an expansive screen coupled with a hearty battery, even if it meant some not-so-competitive hardware components and relatively bland cameras.